Vanessa: Growing up in the north shore suburb of Forestville, my childhood memories of eating out consisted of a fisherman’s basket from the local fish & chip shop and sizzling Mongolian lamb from the one and only Chinese restaurant. Fast forward 20 years and the suburbs of Sydney are now offering up a variety of different cuisines to suits various tastes and budgets. The suburb of Roseville is home to Teta’s Lebanese Restaurant and it is certainly drawing the locals in. Teta’s (meaning Grandma’s) is a family run Lebanese/Armenian restaurant which showcases an extensive variety of middle eastern dishes that pay homage to the traditions of the culture through food and flavour. Nestled in amongst a row of shops, Teta’s could easily be mistaken for a small, takeaway style shop yet once you step inside there is a spacious seating area upstairs that can cater for large groups of people and in fact is a great space for a group function. As Bianca and Alex are currently on a mission to eat ALL the burgers in Melbourne, I took my partner in crime and name-sake friend, Vanessa aka Vsquared, along with me that evening. We had been invited to sample a range of Teta’s dishes and were presented with an absolute feast. Upon arrival we were greeted with a refreshing cocktail known as the Beirut Cooler which was a blend of fresh watermelon, vodka and ginger beer. This was actually a perfectly refreshing start that prepared us for the heavy meal we were about to consume. It is evident that Teta’s has emphasis on ensuring every dish that leaves the kitchen is vibrant, rich in colour and full of flavour. One of the first things I noticed as our dishes were being set down was the attention that had been paid to garnishing the dishes to intensify their visual appeal. The banquet began with a large number of mezze entrees being brought out starting with the mixed dip platters. Generous plates of hommus, baba ghanouj and Labne were served alongside fried bread. Is there anything more wicked that bread that has been deep-fried!? It made for the perfect accompaniment to the dips and set up our expectations for the food we could expect from Teta’s that evening. The next dish that was presented was the Kibbeh Nayye which is lamb tartare blended with wheat, onion and spices. Now the idea of eating raw, minced lamb is not one that appealed to me but I pushed through and tried it. The flavour was subtle and when eaten with bread and the accompanying condiments I can see the appeal, however it’s probably not something I would order again in a rush. Falafel is another favourite of mine so was very happy to see they were included in the banquet. Tabouli and Fattoush Salad generally cause me much grief if I have to choose between them so I was pleased that we were presented with both to accompany our mains. The salads were so fresh, vibrant and full of flavour. The fattoush was my ultimate favourite that night served in a generous portion of crispy, fried bread (yes more fried bread!). The dressing of pomegranate molasses, lemon juice and EVOO makes for one delicious combination and something I’m going to start trying on my salads at home. Feeling very satisfied at this point, a welcome break came with the arrival of the evening’s entertainment of belly dancers. They got everyone up on their feet which was just as well as there was a lot more food coming our way. It was a great addition to the evening as not only did it break up the meal, but it was entertaining and really got everyone involved. Next up we were presented with a number of different meat skewers. Teta’s offers 1m skewers of chicken, lamb and kafta. These were fantastic and a great way of serving up meat that can be shared amongst a group of people. The lamb and the kafta were so juicy and tender whereas I found the chicken to be a little on the dry side. These were paired well with fried potatoes mixed with coriander, lemon juice and olive oil. We were also brought out a serve of the lemon garlic chicken with was chicken breast tossed in teta’s lemon garlic sauce. This was delicious and not dry at all. The garlic really packs a punch so have the chewing gum on hand for later (and the next day!). Feeling absolutely overwhelmed with the amount of dishes we were served up we sat back and enjoyed a little break before dessert. I ordered a traditional Lebanese coffee which was beautifully presented and rich in flavour. The dessert, a Nutella based pudding with ice-cream and rosewater, was unfortunately overpowered by the rosewater and was a little too strong for a few people’s taste. 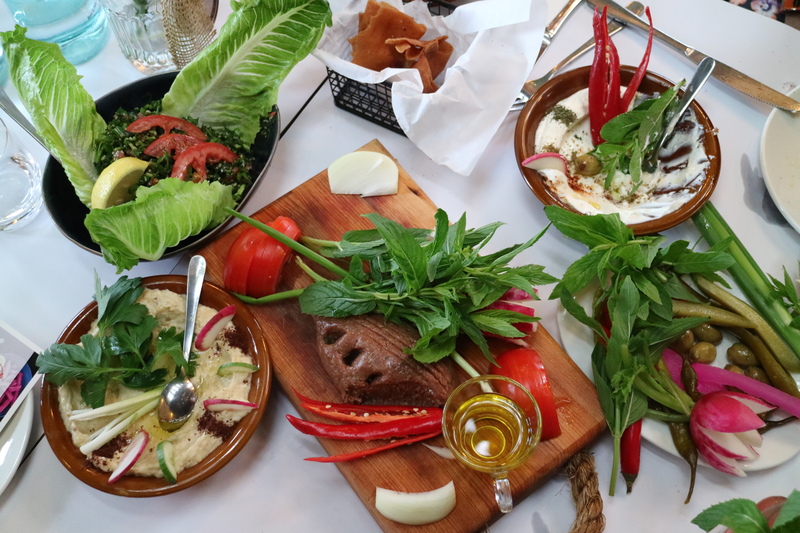 I am really pleased that Teta’s is offering such a wide range of Lebanese dishes to locals and proving that suburban restaurants can offer quality and well-priced food. I would recommend paying Teta’s a visit, particularly if you are dining with a large group. The meals are intended to be shared so the bigger the group, the more variety you can have! I know I will be returning and am looking forward to trying out one of their banquet menus which range from $45-$95pp. I can guarantee you won’t leave Teta’s hungry! *ForFoodsSake were invited to dine at Teta’s Lebanese Restaurant, all opinions expressed are our own. Special thanks to the ladies of @lickyourphone for the invite!